Through Knowledge Management you can immediately access and consult all information and solutions that your IT department has accumulated from managing and providing services. In the Knowledge Management functionality, the IT section stores, updates and publicly shares the data in its possession: a unique and valuable source gathered throughout the service life cycle. HelpdeskAdvanced places Knowledge Management in the foreground as the key to constantly improving Service Management efficiency and quality. How? Through increased satisfaction of users with independent access to a Knowledge Base where they can consult solutions for their own tickets, and through significant savings made in managing previously governed, provided and resolved services. 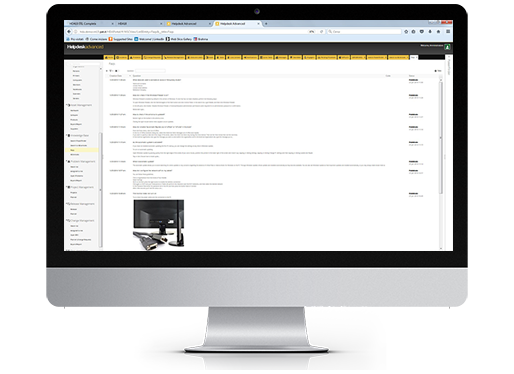 HelpdeskAdvanced uses a search engine to support users in finding solutions to their problems and needs through a typing tool. By consulting solutions, instructions and previously resolved issues published in the Customer Portal’s Knowledge Base, users can resolve their tickets in self-service mode. The Knowledge Base functionality, collaborative in nature and available round-the-clock, significantly reduces response times for resolving tickets. Optimise time, resources and costs in managing services. Increase productivity of IT operators making it easier to check information in the Knowledge Base. Encourage shared knowledge among relevant parties. Improve user satisfaction by enabling users to resolve problems in self-service mode.